Kippy is the office manager at Dentistry on the Village Green. 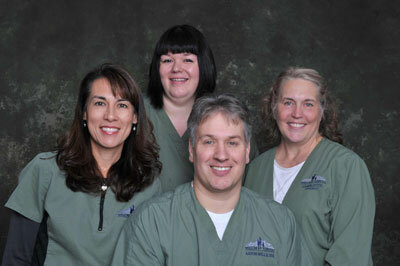 She has been with the practice since its inception in 1972 in one capacity or another. She enjoys working in the family business and especially seeing our patients and getting to be part of their lives. When she's not in the office she enjoys playing tennis, going to Ohio State football games, spending time with friends, and visiting her 12 grandchildren. Michelle is a receptionist at Dentistry on the Village Green. She is a native of the greater Cincinnati area, having graduated from Ursuline Academy and Xavier University. She enjoys that her job allows her the opportunity to interact with our patients and to work with a group of very professional people. When she is not in the office, she loves spending time with her family and church friends. Her favorite activities include travel (Europe is the best! ), sports (Go Reds! ), and being outside (think boating and disc golf!). Angela is a hygienist at Dentistry on the Village Green. She grew up in Springdale and graduated from Princeton High School. She studied Dental Hygiene at the University of Cincinnati Raymond Walters College, and after graduating began practicing at Dentistry on the Village Green. Angela loves working in this field because she gets to know our patients while providing quality care. She now lives in Liberty Township with her husband Chris and their three children. She enjoys watching her kids participate in soccer and gymnastics, trivia nights with girlfriends, beach vacations, and spending time with her family. Julie is a hygienist at Dentistry on the Village Green. She graduated from UC Raymond Walters School of Dental Hygiene and began her career as a part-time hygienist. She loves being a hygienist because she likes the opportunity to meet people and help them learn about oral hygiene. Julie stays busy spending time with her family. She is a mother of three, two girls and one boy. In her spare time, she enjoys having dinner parties with her friends, shopping, exercising, and family activities. Kim is a hygienist at Dentistry on the Village Green. She is from Portsmouth, a small river town in southern Ohio. Kim found an interest in dentistry while going through orthodontics in high school and attended Shawnee State University for her dental hygiene degree. She couldn't be happier with her career decision! Kim loves meeting our patients and tries her best to put their needs first and explain any questions they have concerning their oral health. In her spare time she loves spending it with her husband and two children. When not busy with kids' activities they like to boat, travel and just relax at home! Rachel is a dental assistant at Dentistry on the Village Green. She is a graduate of Fairfield High and the Institute of Medical and Dental Technology. Rachel loves working in the dental field because she enjoys helping people and getting to know our patients. She lives in Fairfield with her husband and their two young sons. They enjoy spending time outdoors hiking and seeing our country's beautiful landscapes. Jessica is a dental assistant at Dentistry on the Village Green. She is a graduate of Hamilton High and the Institute of Medical and Dental Technologies. Jessica's experiences as a dental patient inspired her to become a dental assistant where she can provide empathy to our patients. Her favorite part of her job is meeting people. She also likes that assisting Dr. Gille on a myriad of dental procedures keeps her day busy! When Jessica is not at work, she enjoys spending time with her husband and two sons, fishing on her family's boat, attending community sporting events, and traveling to the Upper Peninsula of Michigan.